A guest post written by Shehani Kay, Ayogo Writer. Given the tough choice between a piece of chocolate cake and a tart green apple, which would you pick? Go on be honest. I know, I’d pick the cake and you’d likely do the same. The reason is obvious. 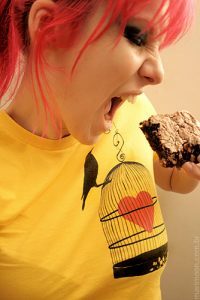 It’s really hard to be rational when faced with cake! And the fact is, we’re really rotten at doing what it takes to stay healthy even when it may cost us our lives. Study after study has shown that most patients won’t change their behavior even under threat of pain and death. According to Dr. Edward Miller, dean of the medical school and chief executive officer of the hospital at Johns Hopkins University, about 600,000 people have bypasses every year in the United States but only 10% of these patients will change their lifestyles to prevent future surgeries, pain and premature death. The other 90% won’t engage in healthier lifestyles despite knowing that they have a serious disease and that they’ll have to trade their fries for brown rice and their steak for greens if they want to survive. Behavioral economics tells us that people often make poor decisions because what we perceive to be reality isn’t so. When it comes to our health, our judgment and decision-making are clouded by our “hard wired” cognitive biases and these biases often lead to not so great decisions. For instance, we like our gratification to be instant. When the reward for being healthy today is too far down the road of tomorrow, we sharply reduce the value of staying healthy. We become victims of hyperbolic discounting – the tendency to prefer smaller payoffs now to larger payoffs later, which leads us to discount the future when it requires us to sacrifice our cake of today. We thus become afflicted with temporal myopia (short-term focus) and irrationality. Furthermore, our hard wiring rewards us for cake and steak. Our reward circuitry entangles us in a neurochemical dance of dopamine and mu opioids (our brain’s version of heroin, which amplifies sensory pleasure). According to Kent Berridge, an expert in affective neuroscience, ‘wanting’ (fuelled by dopamine) drives us to pursue our desire and once we get it, our ‘liking’ circuits release opioids in hedonic hotspots in our brain. So under such herculean odds, how can something like playing social games improve our health or adherence to treatment? 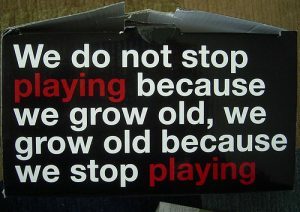 Well, social games are great at harnessing the power of social influence and the power of play to drive engagement; and when these muscles of social connections and game mechanics are flexed in tandem, we can make changes to our behaviour and improve our health in fun ways. What is normal? What is acceptable? When in Rome we tend to do as the Romans do. Our ideas change depending on those around us. Social network analysis has shown us that human networks are organized as hubs with many nodes that congregate in clusters. These clusters act like epidemics passing traits from person to person and norms of behavior spread through networks like a contagion. The work of Christakis and Fowler on obesity suggests that your friend’s friend’s heftiness can influence you. Seems people get fat together! And social “proximity” seems to trump physical proximity – the influence of a friend remained even if the friend was hundreds of miles away. The greatest influence of all was, of course, between mutual close friends – if one became obese, the odds of the other becoming obese were nearly tripled. The study showed that we change our idea of what is an acceptable body type by orienting towards the people in our social network. On a more encouraging note, social network science also shows that people like to do positive things together – like quit smoking! According to another Christakis and Fowler study, which was published in the New England Journal of Medicine, during the 1990s entire clusters of smokers within the network they studied appeared to quit in concert, and groups of adjoining nodes were seen to become nonsmokers too. Quantitative analyses demonstrated a tendency for smokers and nonsmokers to form clusters within the network, and for smokers to move progressively to the periphery of the network, so that by the end of the study, the prevalence of smoking appeared higher at the periphery of the network than at the center. So it seems that while smoking may be addictive, quitting is also contagious! People whose husband or wife quit smoking were 67% less likely to smoke. People with a friend who quit smoking were 36% less likely to smoke. In smaller companies, people with a co-worker who quit smoking were 34% less likely to smoke. People whose brother or sister quit were 25% less likely to smoke. Staying healthy then isn’t simply a matter of your genes and your diet. Good health is also a consequence, in part, of your connection to other healthy people. 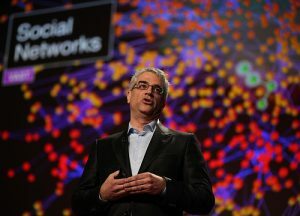 As Christakis points out, people are connected, and so their health is connected. Christakis and Fowler also hypothesize that behaviors spread partly through subconscious social signals we pick up from those around us. These signals serve as cues to what is considered normal behavior. The spread of good or bad feelings, they say, might be a contagion driven partly by “mirror neurons” in the brain that automatically mimic what we see in the faces of those around us. So clearly, who we come in contact with and who we are socially connected to can have a profound influence on us, ranging from how happy or fat we are to our ability to successfully quit smoking. Connecting with our friends to do things drives our engagement and increases our chances of success. One of the great challenges for modifying behavior is a lack of engagement – behavior change is often more a journey than a process. We want to change but when it’s not fun and rewarding, we get bored – we put on our temporal myopic-tinted glasses and indulge in a little hyperbolic discounting. This is where the power of play can help –– play and games are super engagement generators because (typically) their focus is on FUN. If we want to get people to do the things they need to do, the best way to get them to do it is to make it playful. Isn’t this why parents often choo choo train food into the mouths of their babies? Babies aren’t fools; they want their mushy peas to be engaging. As adults, we’re not that much different. Social games use mechanics that are engineered to capture and maintain our engagement. They reward us quickly, often and constantly, which outfoxes our desire for instant gratification. By providing an objective measure on how well we’re doing with constant feedback on our progress, a way to track our progression and opportunities to level up, social games boost our confidence to do more and increases our sense of self-efficacy. With a little healthy competition to motivate us to play harder and longer towards achieving our goals, we not only get the chance to gloat over our sense of accomplishment when we ‘git ‘er done’, we also get worthy achievements to brag about to our friends via our social media and networking tools. What’s more, social games also give us a space (feeds, walls) to give each other support, encouragement and positive feedback – space enough for us to build a support network system. By propagating though invitations games help us build our own networks, which is great because the more mutual friends we have playing with us the more engaged we are in playing and the more we’ll be invested in succeeding in the game. They also offer us an opportunity to socially interact with our family and friends while we compete, collaborate, work as a team, and talk about our progress in the game. By leveraging social connections and game mechanics, social games could be the powerful tool we’ve been looking for in healthcare. Social health games like Healthseeker, Daily Challenge and Keas are leading the way in this arena. They exemplify how connecting with friends drives engagement and how small networks of friends can create powerful experiences for making behavioral changes that have real world health benefits. Small incremental changes can lead to permanent change. And because we are all connected changing the behaviour of small clusters of people within a community can have a ripple effect over entire populations. Healthy behaviour can be contagious and our goal at Ayogo with our GoodLife™ games is to make better health a fun thing to spread. Other social health games like Monster Manor and DiabetesSisters’ SisterMatch propose to help people manage their diabetes and engage them in their own healthcare. By providing peer support, knowledge and fun, these games aim to motivate healthy behavior, increase treatment adherence and make self-management easier.